Calvin is now officially one year of age so I really wanted to do something special and bake up a homemade dog cupcake recipe. (For the complete ‘Easy Peanut Butter Cupcakes for Dogs’ recipe, scroll down to the bottom of the page). I also had to take some time looking back at old photos and seeing how he’s grown since last spring. into this strong, strapping 23-pound beagle. …too many gifts to explore and too many unfamiliar holiday sights and smells completely wore him out. Life is tough for this beagle. and Bubble, to name a few. To commemorate a full year in the life of Calvin, I had to take a look back at the first photos I took. 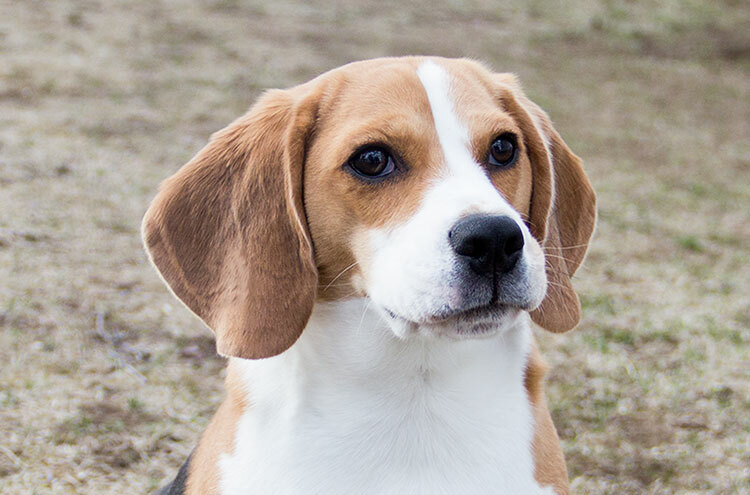 …to this full-grown beagle with a very healthy appreciation of dog cupcake recipes! I wanted to make something a little unique and special to celebrate Calvin’s first year of life. So I came up with a homemade birthday dog cupcake recipe. The cupcakes are very simple to make and quick to prepare in about 15 minutes. Calvin eats any treats that are handed to him in under .4 seconds flat. For these “pupcakes,” I used brown rice flour. But any type of flour you have on hand should work. And, since peanut butter is one of Cal’s all-time favorites, they have a special peanut butter frosting. Very heartily approved – he adores these! In a mixing bowl, stir the flour, baking powder, canola oil, applesauce, egg, and honey until well combined. Insert cupcake liners into a muffin or cupcake pan. Spoon mixture into cupcake liners, filling each about halfway. Bake for about 10-12 minutes, or until a toothpick inserted in the center of a cupcake comes out clean. Meanwhile, in a bowl, stir yogurt and peanut butter until mixture is smooth and creamy. Use a small spatula or butter knife to smooth a thin layer of the peanut butter frosting over each cupcake. Storage: cupcakes should hold up for 4-5 days if stored in an airtight container in a cool, shaded, dry spot. Peanut butter frosting should be stored separately, covered and refrigerated. Frost cupcakes immediately before serving. Always consult your veterinarian before introducing any new ingredients into your pet’s diet. Awww what a cute little puppy!! I’ll have to pass this recipe on to my friend with dogs! You’re so adorable .. and so is he. Cupcakes for dogs … how sweet is that. Love your gallery of him. Maybe not a puppy, but he are cute as one … I think dogs should always be puppies .. and cats kittens. I wonder why I haven’t got your other notices .. for you posts. Ages since I heard anything from you. Here I can see .. you have posted quite a few. IT’s so adorable you made him a cupcake! You can call your baby a puppy for forever, I think! Awwwwwwwww!!! I love beagles!! Happy Birthday Puppy! GAH! He is just the cutest! Happy birthday to your little darling. These pupcakes are adorbs!!!! Calvin is the cutest, love that you celebrated with dog cupcakes! OMGOSHHH how cute is that little pup? My pup actually turns two in a couple days so I’m really glad to see this recipe! She is also a lover of peanut butter (as is every dog). Such a sweet doggie! 🙂 Happy Birthday little guy! That little puppy face is just too cute! What a great idea! Happy birthday Calvin! Aww what a sweet little pup! I love Beagles so much. Does he bark/howl a lot? My boyfriend and I might get a dog when we move in together and I want to lobby hard for a beagle, but he says they bark too much. I say that’s just upbringing though. We have a beagle too and I know how obsessed they are with food, youCalvin him the best birthday gift ever!! So cute! I don’t have a dog but if I did he looks like he would be the perfect puppy. He is still very cute and what a fun recipe! Looks like it’s Calvin–approved! Happy Birthday to your sweet puppy, he’s always adorable! Oh my goodness — absolutely adorable! So, so cute! These cupcakes are such a great idea and your puppy photos are beyond cute. I love the wrapper hanging from his mouth. Oh my goodness! These pictures are adorable. I love the doggie cupcake idea…I’d love to see more of our friendly companions’ treats in the future! Thanks for sharing his birthday…he certainly has grown from that adorable puppy into a beautiful dog. Oh these pictures are adorable – too cute! I found your blog while searching for healthy dog treats for the 2nd anniversary of our puppy’s arrival home and am so glad that I did. They were a breeze to make but, more importantly, he absolutely loved them. You managed to calm my Jack Russell puppy for as long as he sat down and licked the frosting off of his paws. Thank you! He is so precious! My Boxer named Penny is going to be a year old in a couple of days. I will make these for her. What a sweetie pie! Happy Birthday! I just made the cupcakes for the graduation of my beginner agility course class. They were the hit with everyone!!! my two mixed breed went crazy over them. Even the picky miniature poodle was thrilled! I even tried a little bit of the frosting and cake and was quite please with the flavor. My instructor almost ate one by accident!!! I did change the recipe to have soy flour instead of grain because so many pets have grain allergies, it did great! thanks for the easy, wonderful recipe! What a great comment – I loved reading this 🙂 Thanks so much for taking the time to let me know how these “pupcakes” turned out for you! Hi I just love him. I have four beautiful beagle girls, Maddison & Molly are 12 years and Charlotte & Clare are 8 years. That get even more gorgoeous as they get older. Thanks for you great recipes. Can’t wait to try them out on the girls. all the best and have great fun with Calvin. I’m already thinking about getting a second now that Calvin is almost two – beagles are the best 🙂 Hope your four love their treats! OMG! I just found this today as my Baby is 4 today (July 4th 2014) & he is definitely a independent boy! I am going to have to make this for his special day. I love your little guy Calvin he is soo cute…I might have to go get “Scotch” a little friend especially since his kitty friend “Baby” died January 14th 2013 & he just adored her, lots of people said: “No, a dog wont get along with a cat but he use to clean her when she couldn’t from old age/pain. I just know he would love a friend like Calvin!!! Seems the smaller the dog or child the more he loves them. lol ;o) He is part Lab/Pit & Boy did I have to eat my words as I use to be afraid of pits but when my son rescued him I just loved him & he has been the best most lovable dog I have EVER owned. In fact at his second training class at Petco a lady & her husband cried caused they wanted him & everybody who sees him falls in love with him & can’t believe he is the most lovey dog ever. P.S. I hope you keep us informed of Calvin’s fun times! I’m going to make your doggie treats this afternoon. Thanks for the recipe!! The cake looks great! Can I substitute the egg? Any suggestions would be greatly appreciated! Thank you so much for sharing this! I found it on Pinterest and made the cupcakes for my little guy’s birthday yesterday and he loved them! I made sure to blog pictures and gave you credit for the recipe, too. 🙂 Your little one is so cute! I hope he’s still doing well! These were INCREDIBLE! My red min-pin, Kaztiel just celebrated his 4th birthday, and thanks to your recipe, he had the most memorable treat ever! and this is coming from a dog that gets homemade grilled chicken and green beans with his dry food every meal. My wife and I both tried one, and we loved em too! Do all of the ingredients have to be organic or is that the only way for it to be safe for dogs? Also, is all-purpose flour fine too? That is completely your choice 🙂 Personally, I prefer organic ingredients because this means that they are produced without synthetic pesticides and fertilizers and genetically modified organisms and that they likely do not have additives like artificial preservatives or colors (you will know an ingredient is organic if it has a green circular “USDA Organic” label on it). Non-organic ingredients and all-purpose flour will also work for this recipe. Of course, always check with your vet first if you are concerned about the safety of any ingredient for your pet. Hello! I’ll be making these this weekend and am going to make a video on them in the process (like a review). I will make sure to link your post to give credit :). Just wanted to let you know beforehand! Feel free to email me if there are any problems. Hi everyone! I’ve read in many places that baking powder/baking soda is very harmful for dogs. Is it ok to use in a cake like this (delicious sounding ;p) one? Calvin looks like such a sweetheart. I don’t know when you posted this, but I hope you are having fun with the little guy. Thanks! Thank you so much for this great recipe! I just baked them for my pup and can’t wait to give them to her for her birthday tonight! He is so cute. I did not know dogs were allowed to have honey. Can they? Calvin has always been fine eating a little bit of honey, but I’d say to always check with your vet if you’re unsure about any ingredient!